Try as Grandpa might to spin it, littering degrades Wyoming. The opioid epidemic degrades Wyoming — and America — to a much greater degree by fracturing families, hurting communities, and killing Americans. Are Wyoming’s efforts to create jobs and raise revenue by bankrolling opioid manufacturer Cody Laboratories (Cody Labs) a wise use of public development funds? Is Wyoming, like Jalan’s Grandpa, creating jobs by causing indefensible damages? Pharmaceutical companies have experienced record growth in recent years. For example Lannett, the East Coast corporation that owns Cody Labs, has increased annual sales by almost 1000% over the last decade, from $72 million in 2008 to projected sales of $690 million in 2018. Yes, those are opium poppies on the cover of the November 2017 Lannett Investor Presentation. Though Lannett sells a variety of pharmaceuticals, opioid painkillers are a big component to their decade of record grown. Investing in corporations like Lannett can be seen as a smart business move, but the real costs of opioid pharmaceutical proliferation gets passed on to the public. In 2013 the Centers for Disease Control and Prevention reported that the annual “economic burden” of prescription opioid misuse in the US was $78.5 billion. Since then the epidemic has gotten worse, and the White House’s Council of Economic Advisers recently estimated that the cost of the opioid crisis in 2015 alone was $504 billion, nearly 3% of US gross domestic product (GDP). Even Americans who have never tried opioids, have not lost a loved one to drugs, and have never suffered crimes at the hands of a junkie have been affected financially by the opioid epidemic. Since 2012 the State of Wyoming has invested $25.5 million in Cody Labs, a wholly owned subsidiary of the Philadelphia-based Lannett Company. Cody Labs manufactures opioid, cocaine, and amphetamine active pharmaceutical ingredients. Cody Labs also manufactures reference standard barbituate, cocaine, hydrocodone, oxycodone, and morphine. These dangerous drugs are the only products listed on the Cody Labs website. With help from the State of Wyoming, Cody Labs hopes to increase annual production capacity from 11 to 25 metric tons. Cody Labs currently manufactures ~5 metric tons of opioids, cocaine, amphetamines, and barbituates annually. Are Cody Laboratories, the Lannett Company, and the State of Wyoming banking on the prescription drug epidemic actually getting worse? Why else would they invest millions to increase production capacity to 25 metric tons, 5x the current annual output of 5 metric tons? According to the NIH, more than 115 Americans die every day after overdosing on opioids, and nearly half of those deaths involve prescription opioids like those produced by Cody Laboratories. US opioid overdose deaths were five times higher in 2016 than 1999. The total US drug overdose deaths in 2016 were higher than the number of deaths linked to guns, car crashes, or HIV/AIDS during any single year. More Americans died of drug overdoses in 2016 than Americans killed in the entirety of the Vietnam War. According to the CDC, of the more than 63,600 overdose deaths that year, at least 42,249 — 66% of the total — involved opioids. Forty two thousand, two hundred forty nine deaths due to opioids was a 30 percent increase from the year before and preliminary data puts the 2017 deaths 13.3% higher than that. As if this wasn’t bad enough, the actual number of drug overdose deaths in America is probably much higher than the official statistics show. A recent study published in the February edition of the journal Addiction reported that the country is undercounting opioid-related overdoses by 20 to 35 percent. Standards for how to investigate and report on overdoses vary widely across states and counties, and opioid overdose deaths aren’t accurately reported in the data analyzed by the federal government. Currently less than 5% of deaths are autopsied, so we don’t really know with certainty what most Americans die from. Additionlly, there are obvious social stigmas associated with death by drug overdose, so county coroners have a clear motivation to report otherwise. More often than not, coroners don’t check for drugs, and even when drug tests come back positive for opioids that may not be reported as a factor in the cause of death. Of course not everyone who abuses opioids overdoses, and not everyone who overdoses dies. In a March 6th, 2018 report, the CDC stated that the US opioid epidemic continues to worsen with emergency room visits (reported by 52 jurisdictions in 45 states) for suspected opioid overdoses increasing 30 percent from July 2016 through September 2017. Suspected opioid overdoses increased for both men and women, across all age groups, and in all regions: the largest increase was in the Midwest (70 percent), followed by the West (40 percent), Northeast (21 percent), Southwest (20 percent), and Southeast (14 percent). Wyoming was not one of the states examined in the recent CDC report because, as the Casper Star Tribune reported on May 6th, 2017, “As prescription drug deaths rock U.S., Wyoming lacks data to gauge overdose severity“. We don’t really know how many Wyomingites have died from drug overdoses, but at least 304 overdose deaths were reported from 2014-2016. In 2017 the Wyoming Prescription Drug Abuse Stakeholders group said that when compared to other US States, Wyoming has the 15th highest overdose death rate in the country and is 11th in rates for people ages 12 to 25. Wyomingites are taking steps to confront the opioid epidemic sweeping across America. Wyoming Prescription Drug Abuse Stakeholders is educating kids and communities about the dangers of pharmaceutical drugs. Media organizations statewide are putting out informative coverage on the topic including in-depth reporting on locals who have died from drug overdoses or are still battling addiction. Teton County may follow the example of many political entities nationwide as it considers lawsuits against opioid manufacturers for deceptive advertising, and the Wyoming State Legislature recently passed two bills addressing prescription opioids and other dangerous legal drugs. One of the bills requires “certain health care practitioners to file prescriptions for controlled substances with the state board of pharmacy.” The other bill establishes an opioid addiction task force to study, “accommodat[ing] the legitimate uses of prescription drugs for palliative care with efforts to control the dangerous and illegal uses of those drugs”. Wyoming’s newly formed task force has been funded with $65,000 to cover travel, salary, and per diem expenses for members. Percentage wise, Wyoming is spending ~0.25% (1/400th) of what it invested in Cody Labs on the newly-appointed opioid addiction task force. Let’s take a closer look at Cody Labs, the Lannett Company, and their profitable relationship with the State of Wyoming. As we already know, Cody Laboratories in Cody, Wyoming manufactures opioids, cocaine, amphetamines, and barbituates for the Lannett Company, a profitable, Philadelphia-based, Delaware-reincorporated corporation specializing in generic pharmaceuticals. Competitive Strengths: Vertically Integrated Manufacturer, Supplier and Distributor of Narcotics and Controlled Drugs. One initiative that is at the core of the Company’s strategy is to continue leveraging the asset we acquired in 2007, Cody Labs. In July 2008, the DEA granted Cody Labs a license to directly import concentrated poppy straw for conversion into opioid-based commercial APIs for use in various dosage forms for pain management. The value of this license comes from the fact that, to date, only a limited number of companies in the U.S. have been granted this license. This license, along with Cody Labs’ expertise in API development and manufacture, allows the Company to perform in a market with high barriers to entry, no foreign dosage form competition and limited domestic competition. Because of this vertical integration, the Company has direct control of its supply and can avoid increased costs associated with buying APIs from third-party manufacturers, thereby achieving higher margins. The Company can also leverage this vertical integration not only for direct supply of opioid-based APIs, but also for the manufacture of non-opioid-based APIs. The Company believes that the demand for controlled substance, pain management drugs will continue to grow as the “Baby Boomer” generation ages. By concentrating additional resources in the development of opioid-based APIs and abuse deterrent features to current dosage forms, the Company is well-positioned to take advantage of this opportunity. The Company is currently vertically integrated on two products with several others in various stages of development. In 2005 Lannett had total sales of $45 million, but after breaking its own records year after year, 2017 total sales were $637 million with projections of sales topping $690 million in 2018. Their March 2018 Investor Relations Presentation lists total assets at $1,659,000 and total liabilities at $1,066,000, so the total equity of the publicly listed company (LCI) is $593 million. Lannett claims to operate at an adjusted gross margin of 48-49%, which essentially means they pocket about $2 for every dollar they spend. Lannett’s tax rate just dropped from ~35% to ~27% which means the corporation will pocket millions more in profits this year. This prompts the obvious question: why does a company worth hundreds of millions of dollars that just got an 8% tax break need to borrow a measly $25.5 million from the State of Wyoming? In April of 2012 the Wyoming SLIB granted $2,531,424 to Cody Laboratories to construct a 23,725 square foot warehouse facility to be attached to the existing Cody Laboratories facility. On October 6th, 2016 the SLIB — Gov. Matt Mead, Secretary of State Ed Murray, Treasurer Mark Gordon, Auditor Cynthia Cloud and Superintendent of Public Instruction Jillian Balow — granted an $11 million low interest loan to Cody Laboratories. On October 5th, 2017 the Wyoming SLIB granted an additional $12 million low interest loan to Cody Laboratories. Grand total? $25,531,424. Cody Laboratories is still seeking an additional $10,750,000 from the State of Wyoming. Should Governer Matt Mead and the rest of the Wyoming SLIB grant their request? Please share your thoughts in the comments and consider contacting the Wyoming SLIB members to let them know where Wyomingites stand on this issue. US Opioid overdose deaths were five times higher in 2016 than 1999. Over the last few years, powerful synthetic opioids like fentanyl have ratcheted the death toll higher, but the vast majority of Americans on opioids are using the old fashioned stuff extracted from the opium poppy plant. Opium production in Afghanistan has been on the rise since U.S. occupation started in 2001. Afghanistan has been the world’s greatest illicit opium producer, ahead of Burma (Myanmar), the “Golden Triangle“, and Latin America since 1992, excluding the year 2001. 2001 is an interesting year because late in 2001 the US military invaded Afghanistan, overthrowing the same Taliban that it had supported in their previous war against Russia. The Afghani Taliban lost the support of the US Military — and indeed became a top priority target — because they banned the cultivation of opium poppies in 2000. Afghanistan’s opium production fell by more than 90% in 2001 because the Taliban was able to enforce the ban. By 2002, under the US occupation, opium production quickly rebounded to previous levels despite publicized claims that the US was cracking down on Afghani opium production. Either the US military is a lot less effective than the Taliban at enforcing laws, or the US military is disingenuously defending the global opioid market it controls. In reality, the US Government’s “War on Drugs” is actually a war on competition against unauthorized distributors. For narcotics ranging from cocaine to opioids, the world’s largest legal (and illegal) drug manufacturing and distribution networks employ the protection services of the US Military. This may strike some people as impossibly unbelievable, but the tiniest bit of intellectual effort reveals hundreds of reputable sources dating back decades documenting this unfortunate reality. As such, it should come as no surprise to a thinking human that the State of Wyoming is merely following in the footsteps of the Federal Government by getting in on a little bit of the action. One Love. Peace. If you would like to learn more check out the top four links listed below. NOTE: These articles don’t write themselves and I don’t get paid very much to research and write them. I am trying to make a living at this work and could sure use your help. 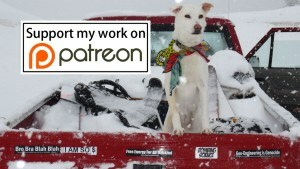 Please consider supporting my work on Patreon.com or via PayPal.com. Thank you for your attention and any support you can offer. Every little bit helps!